Interesting in this highlight is that, as it is a same-day-edit, most of the footage we had worked with was filmed by our videographers and cinematographers during the morning’s preparations. This gave us ample space to incorporate and accent deeper elements and subtleties of the wedding day morning and ceremony. In particular, symbols and objects that hold paramount importance on a wedding; such as the wedding gifts and – most importantly – the wedding ring. You can see in the highlight that we chose some creative vantage points to introduce the wedding ring. As well, an interesting time-lapse shot (of many) showcasing the groom’s wedding watch, our videographers and cinematographers thought was quite an interesting and creative take to the morning highlights. As with wedding day mornings, a plethora of scenes filled with sentimental and candid shots of Mary & George as they prepare for the big day ahead. Something rather novel for our videographers and cinematographers to note was Mary & George’s choice in “letters” for one another; wrapped in envelopes in the form of touch-screen tablets and written in personalized videos addressed to their most precious loved one on a truly precious day. Funny how gadgets like these come and go but the sincere sentiment between people last forever. 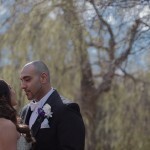 With morning’s Egyptian wedding memories captured in full, Mary & George finally proceed to the beautiful St. Mary & St. Joseph Coptic Orthodox Church for the moment of truth. To continue the earlier theme, our videographers and cinematographers had chosen to feature a gorgeous panorama shot of the skyline just above the church filmed from our drone camera, and immediately after, we get creative with an excellently executed time-lapse of the Coptic church’s front facade. Luckily, on both accounts, the sky was a beautiful spotless blue which made the footage absolutely perfect. And to continue the sequence of perfect scenes, Mary’s arrival at the church was a special pick for our videographers and cinematographers. From the opening of the front doors to a shot of the bride’s walk down the aisle, and a frame-perfect scene of George looking on, overcome with emotion. Truly a magical experience captured by our cameras. And as with the many Egyptian orthodox christian weddings we’ve filmed, the wedding ceremony alone is a treasure to be able to film. With Mary & George in gorgeous robes and beautifully decorated crowns, the wedding ceremony turned out absolutely regal from our lenses! And with Mary & George finally pronounced husband and wife, unanimous cheers from the jubilant crowd as the couple emerges, hands on high as they make their first steps towards a life and future together. 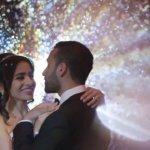 To put an interesting tone to the same-day-edit’s sequence of scenes, our videographers had chosen to perfectly sync the couple’s exit from the church and their entrance to their celebratory venue with an aptly timed change of music. For their wedding reception venue, newlyweds Mary & George had chosen a long-standing favorite among our videographers and cinematographers; Vaughan’s very own Hazelton Manor Banquet & Conference Centre, for an evening of lively dancing and celebration to commemorate a life together made anew. And as the same-day-edit highlight reel closes just in time to be played at the final hours of a truly wonderful wedding day experience, we here at SDE Weddings, Toronto’s premier wedding videography, cinematography and photo-booth rental group, are left with a final congratulations to Mary & George on a perfect wedding day made complete. We wish the newlyweds all the very best in their newfound life together, and hope sincerely that our work with them, though for simply a day, will remain with them throughout the many days of their lives. Egyptian Wedding ceremony: St. Mary & St. Joseph Coptic Orthodox Church | 11308 Yonge St. 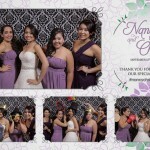 Wedding reception: Hazelton Manor Banquet & Conference Centre | 99 Peelar Rd.